We Don’t Share Your Private Information. Hotel Shradha Saburi Palace respects the privacy of all our guests, and we are committed to protecting it. To best serve you throughout this website, you will be asked to provide a variety of information, such as name, mailing address, telephone number, email address, credit card information, etc. This information will allow us to provide a personalized experience for each visitor to our website. This website does not collect, save or store any personal information from visitors that simply browse this website, unless you voluntarily and intentionally provide it to us. We do not collect personal information without your knowledge or consent. Any personal information that is requested on our website is necessary in order to perform a particular service, such as processing your reservation, enrolling you in Hotel Shradha Saburi Palace Shirdi. We request personal information from you in order to process online reservations. You must provide contact information (such as name, mailing address, telephone number and email address) as well as financial information (such as credit card number and expiration date, etc.) in order for us to process your reservation. This information is used for billing purposes and to reserve a room. If there is a problem with a reservation, the information provided will also allow us to contact you. In order to book a room you must complete an enrollment form. During enrollment, new members are required to provide certain contact information. We use this information to create a member profile of your previous and future stays at Hotel Shradha Saburi Palace Shirdi. The member may be provided unique identifiers (such as username and password), among other information. Such information enables us to provide a more personalized experience for our members on our websites, as well as to direct relevant communications to them. 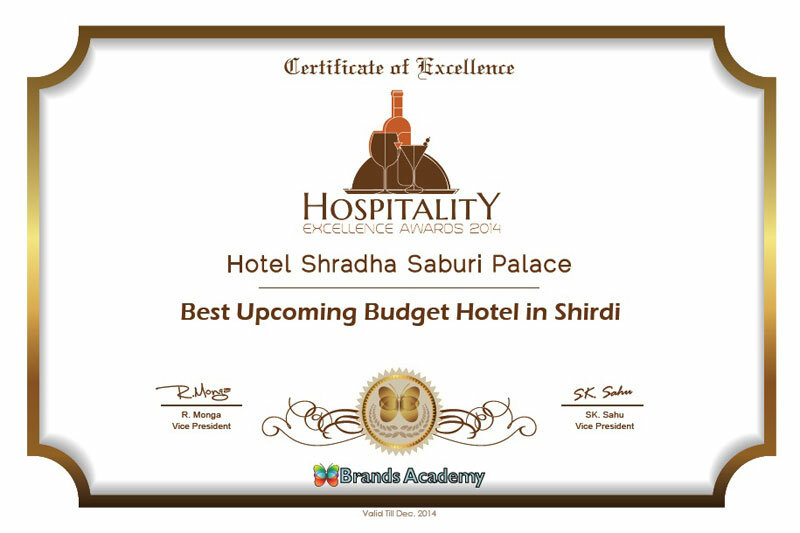 Hotel Shradha Saburi Palace may inform you by email of our available services, products, specials and sweepstakes. You may opt in or out of receiving these materials at any time. Hotel Shradha Saburi Palace will not sell or distribute any of your personal information to any outside organization for marketing or solicitation without your permission. Hotel Shradha Saburi Palace is committed to the security of the data collected on this Web site, and treat all information you provide us as confidential. We use secure socket layer (SSL) encryption technology to secure the privacy of credit card information, name, address, email and other information you provide us. Please be aware that third-party Web sites available through links on omnihotels.com each have separate privacy and data collection practices. We have no control, responsibility or liability for these third-party policies or actions. Hotel Shradha Saburi Palace cannot ensure or warrant the security of any information you disclose online to third party sites. This website is subject to Indian Law.